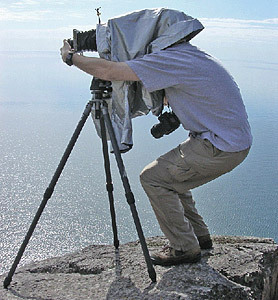 As you can see on the Why Large Format Photography? page, this is what it looks like to use a 4x5 camera. The process is slow, cumbersome, but unquestionably rewarding in its own way. Much has been written about the virtues of the deliberate approach demanded by the use of a large format film camera. In my experience, being forced to thoughtfully visualize the scene in front of me, and carefully compose and focus each image prior to deciding whether or not to take a picture, helped me hone my eye for a good photograph and dramatically increased the percentage of images I considered "keepers." That said, for me the only truly compelling reason for me to use a 4x5 camera is for the image quality. Despite the aesthetic virtues of large format photography, it is clear from my experience with digital photography that this method is also rewarding in its own right. With digital photography, one receives immediate and accurate feedback about each photograph. Is it exposed properly? Are there blown-out highlights? Blocked-up shadows? How compelling is the composition? Is the focus accurate? Did the wind shake the camera and blur the image? Mistakes can be easily identified, and quickly rectified by shooting again with the proper settings. When I find myself lucky enough to encounter truly extraordinary and fleeting light, instant feedback that that I've successfully captured the shot is priceless. With my 4x5 camera, answers to the above questions typically came weeks after the sheet of film was exposed. More than once, I learned after the fact that the film I received back from the photo lab failed to live up to my visualization when photographing the scene. At $5 per photograph including film and processing costs, this was often an expensive lesson. The instant and accurate feedback associated with digital photography avoids a considerable inconvenience with large format photography. And thanks to my large format photography background and learned tendency to carefully visualize and compose scenes before taking photographs, I am able to approach digital photography from a more disciplined and thoughtful perspective.